The NFL is in hot water again after rejecting a Super Bowl advertisement from American Veterans (AMVETS). The ad asks people to stand for the National Anthem. Adding insult to injury, the NFL reportedly asked the organization to submit an ad and then declined to accept it. "American Veterans appreciated the opportunity to place an ad in the Super Bowl LII program at the invitation of the National Football League, but that appreciation quickly gave way to deep disappointment when we learned your staff had refused to publish our ad because of its simple, two-word message -- '#PleaseStand,'" AMVETS National Commander Marion Polk wrote in a scathing letter to NFL Commissioner Roger Goodell. "While we are well aware of the controversy surrounding players kneeling during the National Anthem and the public relations problem it has caused the NFL, our ad is neither a demand nor a judgement upon those who choose to kneel during the National Anthem. It's a simple, polite request that represents the sentiment of membership, particularly those whose missing or paralyzed limbs preclude standing." "We sought to give a new context to the discussion from the perspective of veterans who had been largely disregarded. Your staff's decision to reject the ad, after asking AMVETS to purchase the ad space, serves to make that disregard even more stark and unfortunate," Polk continued. The letter didn't stop there, with Polk reminding Goodell that veterans aren't to be used as props or fake good will. "Mr. Goodell, veterans are good for more than just military aircraft flyovers, photo opportunities during halftime, or props to sell camouflage-style NFL apparel; although, the NFL's stance on not allowing the veterans' unfiltered voice to be heard says otherwise," Polk said. The #PleaseStand ad has been accepted to run during NBA and NHL games, which Polk says makes the NFL's decision not to run it even more egregious. "Freedom of speech works both ways. We respect the rights of those who choose to protest, as these rights are precisely what our members have found -- and in many cases died -- for. But imposing corporate censorship to deny that same right to those veterans who have secured it for us all is reprehensible and totally beyond the pay," Polk said. 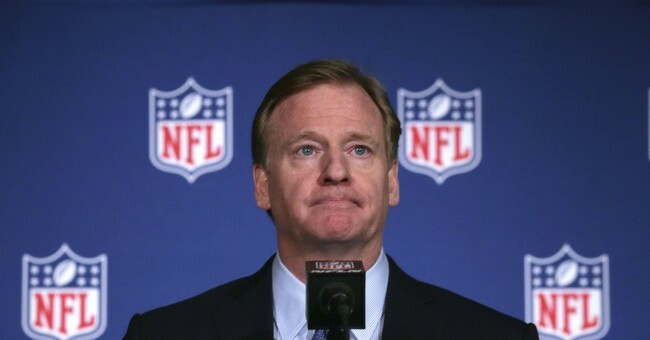 "The NFL's intention to avoid controversy in this instance by suppressing our voice will have the opposite effect." The NFL responded with a statement. "The Super Bowl program is designed for fans to commemorate and celebrate the game, players, teams and the Super Bowl. It has never been a place for advertising that could be considered by some that could be considered by some as a political statement," NFL Vice President of Communications Brian McCarthy said. The Philadelphia Eagles will take on the New England Patriots in Super Bowl on Sunday, February 4, 2018.